Recent years have brought about important advances in the experimental measurements and theoretical understanding of jets and heavy flavor production in hadronic and nuclear collisions. With results from the Relativistic Heavy Ion Collider (RHIC) and Large Hadron Collider (LHC) proton-proton and heavy ion runs at hand, this is the opportune time to continue the focused discussion between the high energy and nuclear physics communities on the interpretation of the data. This workshop, to be held at the UCLA IDRE Portal in the Math Sciences Building, will bring together senior researchers, postdoctoral fellows and talented graduate students to discuss the exciting recent developments and future directions in high energy and nuclear science. The purpose of the 2019 Santa Fe Jets and Heavy Flavor workshop is to summarize the accomplishments and provide guidance for the community effort in the areas of hadronic jets, jet substructure, quarkonia and open heavy flavor, with emphasis on perturbative Quantum Chromodynamics (pQCD) and Soft Collinear Effective Theory (SCET). The theory is closely tied to experiments at the leading nuclear and particle physics facilities in the US and abroad, such as the RHIC at Brookhaven National Lab and the LHC complex at CERN. The workshop is also central to the physics goals of the next-generation nuclear physics facility in the US, the Electron Ion Collider (EIC), which has received strongest support from NSAC Long Rang Plan and a NAS report. 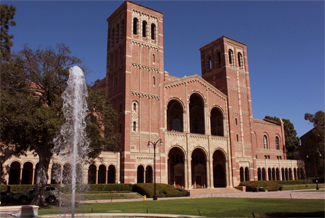 After three successful workshops held at Santa Fe in 2016, 2017, and 2018, the fourth edition of the workshop in 2019 will be moved to Los Angeles and will be hosted by University of California Los Angeles (UCLA). The 2019 Santa Fe Jets and Heavy Flavor workshop will take place January 28-30, 2019 at UCLA campus. If you need an invitation letter for applying for a U.S. visa to attend the workshop, please send your request to Prof. Zhongbo Kang. While available, some discounted rooms are available for attendees, both on and off campus. Please click this link for more information. For questions regarding technical issues, agenda items, abstract, etc., please contact the Scientific Organizer, Prof. Zhongbo Kang. For general questions about travel, hotel reservation, parking, etc., please contact the Conference Coordinator, Ms. Maria Salinas. October 5, 2018: Online payment of the $50 registration fee is now available. The registration fee covers the cost of morning and afternoon coffee breaks. An optional banquet ticket may be ordered ($50 per ticket). 2019 Santa Fe Jets and Heavy Flavor Workshop at UCLA is supported by the Mani L. Bhaumik Institute for Theoretical Physics at UCLA and the Los Alamos National Laboratory. Copyright © 2019 UCLA. All Rights Reserved.